The new wireless memory chips harvest the energy generated from NFC and RFID actions to power up small devices so that a battery or other power supply no longer needs to be included. STMicroelectronics has launched a new NFC chip that uses “energy harvesting” technology to power up the device it is built into, eliminating the need for a battery or other form of power supply to be built into the device. ST’s chip features a low power I2C interface as well as a 13.56 MHz RF interface. This RF interface can harvest ambient radio waves emitted by RFID reader/writers and convert those waves into a voltage output that can then be used to power other electronic components. The new M24LR16E chip is part of ST’s dual-interface wireless memory range. These chips act as a bridge between ISO 15693 capable NFC phones and electronic devices, allowing live data to be transferred from the device to a phone or a dedicated RFID reader. The chips behave like a standard tag from the reader’s perspective but, because they also feature a wired interface, they can be embedded into a wide range of devices such as consumer electronics products, portable healthcare and wellness devices and home appliances. Consumers and business users can then use an NFC phone to collect live data such as blood pressure readings or the temperature of frozen goods in transit. “The energy harvesting capability of the Eeprom will enable new types of miniaturized electronics,” the company adds. The M24LR16E can be read or written to directly using equipment such as an RFID reader or NFC phone and integrates additional power management circuitry to make harvested energy available to other devices on the board via an output pin. The nominal output voltage is between 1.7 and 2.3V, allowing the memory to supply many types of devices including low voltage CMOS chips. Wireless operation requires an antenna that can simply be etched on the printed circuit board. “The electrical power available to drive external devices depends on various factors, such as the RF power of the reader, the distance between the reader and the memory’s connected antenna, and the relative sizes of the reader and memory antennas,” says ST. “Assuming adequate RF strength, an RFID device can even be used to power multiple items of equipment placed within range. The Eeprom’s energy harvesting mode can be turned on or off, and the maximum output current set from 300µA to 6mA, by adjusting settings in an internal register. 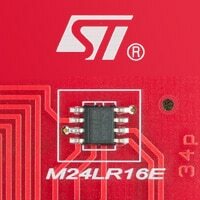 ST has so far demonstrated the capabilities of the M24LR16E chip to illuminate indicator LEDs as well as by powering its batteryless STM8L-based Discovery kit. Other potential applications include e-paper devices such as electronic shelf labels, as well as industrial automation, sensing and monitoring systems, and personal healthcare products, says the company. The new chips are available in volume today at between US$0.60 and US$0.66 each for 1,000 units. An evaluation board is also available from ST.